Yuccas are evergreen perennials with sword-like leaves showcasing beautiful, white blooms cascading down a stalk in the middle of the plant. Growing up to 10 feet tall and 3 feet wide, the yucca grows well primarily in USDA zones 5 to 10. Native to North America, the yucca can be planted in a rock garden or the back of a flower bed with other similar plants, such as agaves and cacti. Yuccas are easy-to-care-for plants, but they do require some maintenance to flourish. Place the yucca plant in an area that receives at least six hours of full sun. Yuccas can tolerate most soils as long as it is well-drained. Avoid planting a yucca flower near high-traffic areas, such as sidewalks, because the sharp leaves can cut deeply if touched. 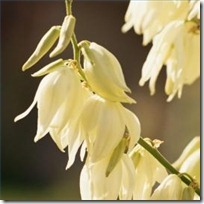 Give the yucca flower 1 inch of water a week during periods of drought. Normal rainfall is enough for the yucca as it is drought-tolerant. Too much water can cause the plant to rot and attract pests, such as the yucca bug. Apply a 1-inch layer of organic mulch around the base of the yucca to ward off weeds and retain moisture. Prune the yucca’s stalk once the flowers have ceased blooming. Remove the stalk with shears 3 inches above where it grows from the mother stem. Wear long sleeves and thick gloves to protect yourself from the yucca’s sharp, pointy leaves. Apply a well-balanced fertilizer (10-10-10) only to a newly planted yucca to promote the growth of the flower stalk during the first growing season. Follow the manufacturer’s directions to determine the amount that should be added to the plant. Sprinkle the fertilizer evenly on the soil and water deeply to ensure the fertilizer reaches the roots.